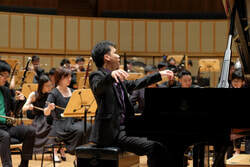 A prize-winning pianist who has been called "a cool and confident performer", Chee-Hang See enjoys a busy career as a recitalist, chamber musician, composer, arranger, and educator. As one-half of the Tan and See Piano Duo, Chee-Hang has performed in Italy, Singapore, and around the United States. Click on the links below to find out more!